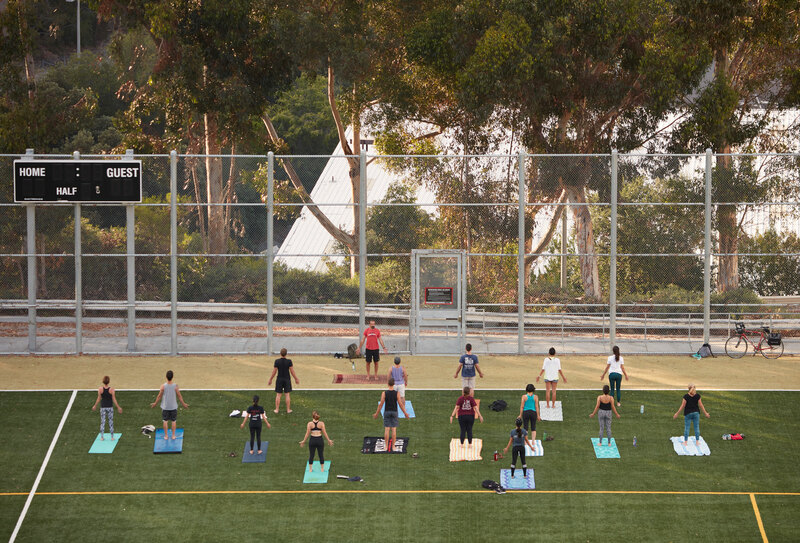 The SDSU Recreation Field is available for daily drop-in play and hosts recreational sports and fitness activities, including intramural sports leagues, sport clubs and fitness classes. The project, which was funded by Associated Students, was completed in August 2016. 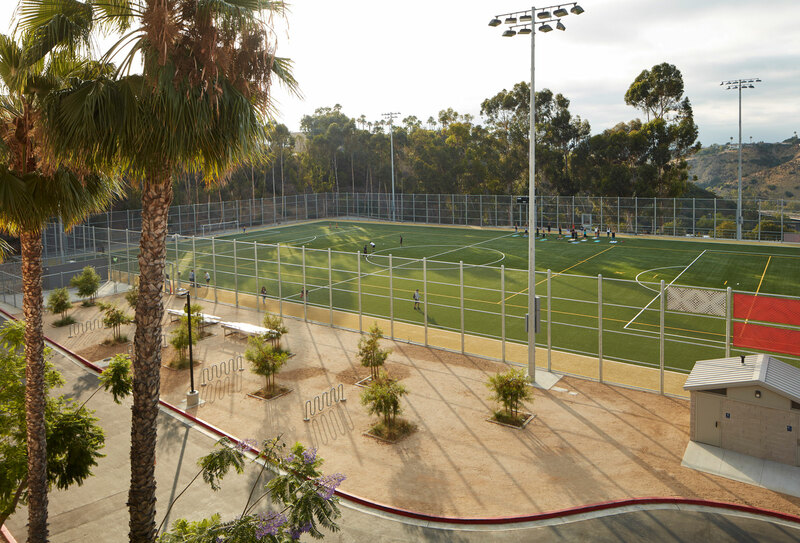 The Recreation Sports Field site was designed and built on the former Lot W parking lot at San Diego State University. Throughout the design phase, extensive geotechnical investigations were conducted to determine there was up to 50 feet of undocumented fill in some locations of the site. Settlement of the parking lot was evident and bound to continue due to the soil conditions. Unique sub-grade waterproofing details were developed and coordinated between the artificial turf installer, civil engineer, and landscape architect. 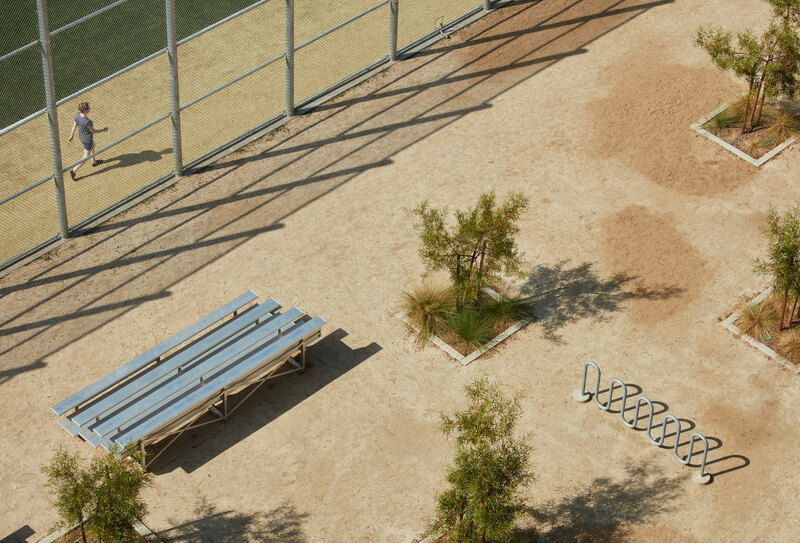 The design team was able to develop a plan for capturing and diverting rain water from the playing field and landscape beds preventing infiltration into the undocumented fill. For this project, a regular meeting schedule among the design team, contractor, client, and construction administrator was developed and allowed for open and transparent discussion of the design coordination and review. All parties were able to provide input throughout the entire design process, enabling regular milestone review to be expedited. 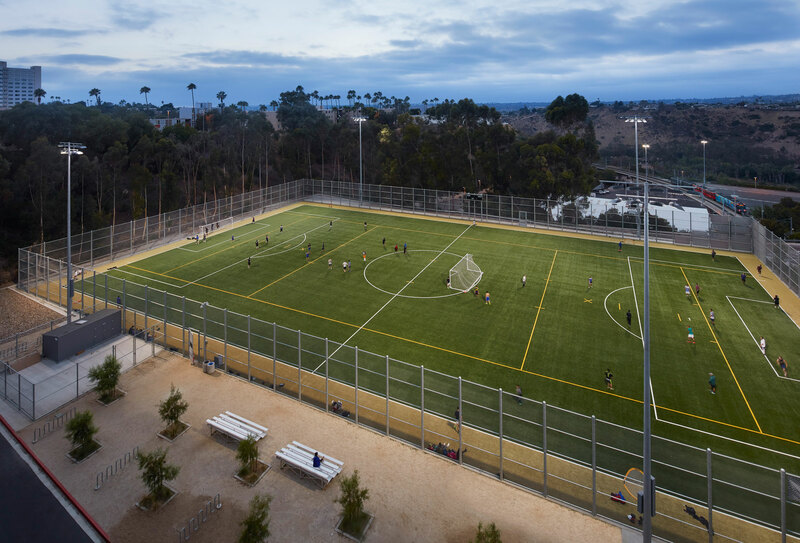 Major product vendors were identified early and were brought in to consult on the design of certain project systems (sports field lighting and synthetic turf vendors). By engaging with companies who were both manufacturers and installers, this reduced the risk of constructability issues in the field. This new field features state-of-the art turf and lighting systems. 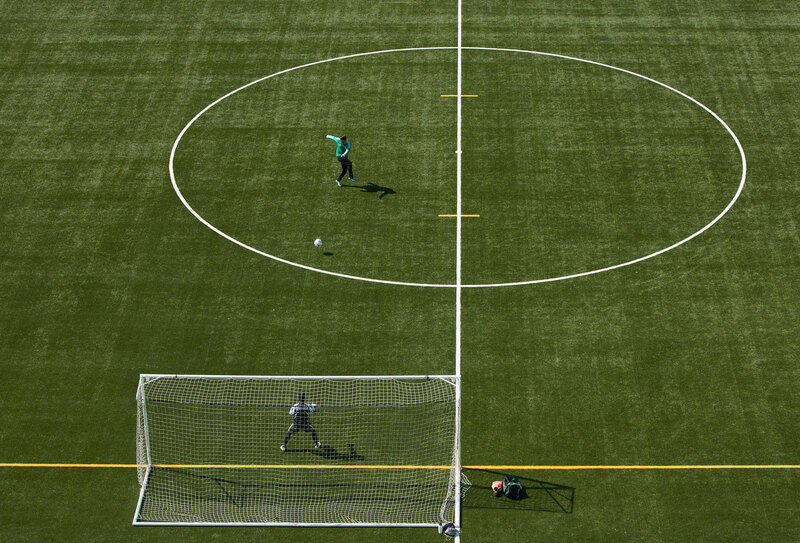 The latest in AstroTurf technology offers excellent shock reduction, lowered temperatures and requires no water, which saves an estimated one million gallons of water per year. The LED lighting is high efficiency, low power and minimizes light spill into the surrounding areas. 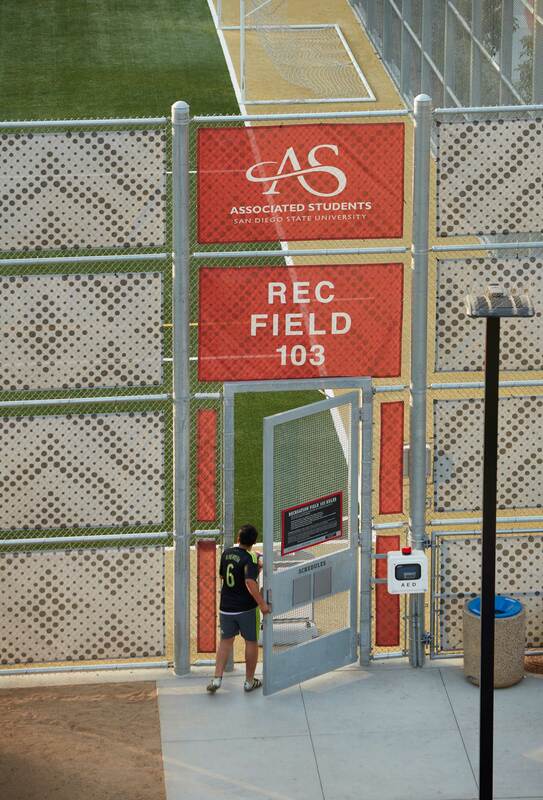 The lighting used on the Recreation Field also uses 60 percent less energy than traditional Metal Halide field lighting, according to Glen Brandenburg, Associate Students facilities and sustainability director.